Modern man no comfort can not live a day. One of the components of such a system is the comfort of online shopping, which allows each of us to get the right thing, sitting at his computer, to pay its electronic money and getting it right at home. This achievement was made possible thanks to the global network. Today there are a lot of payment systems, among which stands out PayPal. With this system you can pay for any purchase or service, which is represented by the Internet, but that's not all. Having a PayPal account, you will be able to send or receive funds. Since the, that is not always well developed infrastructure of e-commerce, with some countries to conduct such financial transactions can not be. PayPal was founded in 2000,, two years later, she teamed up with leading online auction site eBay. It should be noted, that operation using this payment system can be carried out almost in 200 states, and their number is growing every year. 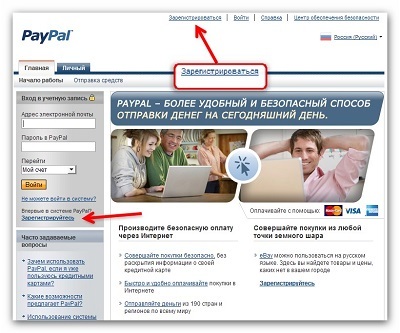 Payment PayPal is using 24 Trade, among which are the Russian Ruble. In this procedure, you choose the language and country of residence, then choose your account. There are three types of accounts – Business, Premier or Personal. At the initial stage of the recommended use of personal accounts. To get any of these accounts, You will need the e-mail address, bank account and credit card. Then it is necessary the introduction of personal data, among which it is necessary to specify your phone, actual residence address, which will deliver the goods, name and surname. The system then provides the binding process of your credit card to the account in the payment system. In the absence of a credit card or unwillingness to attach it now, you can delay the procedure. The last stage of registration – confirmation of your account, which will come to your email address. After registration is complete you will have your password and login as your email address. by the way, password gives the system itself during registration. To happened payment with PayPal, requires verification of payment card, in which the amount will be deducted from it in the amount of 1,95$. You should also refer to the four-digit PayPal. After that, the company confirms your access to the credit card, and money, that you have paid for verification, They will be returned back to you. there are cases, when funds, is on your map, presented in a single currency, and purchase to pay in another. Do not worry, the system automatically generate the exchange and deduct the amount of the required currency. Another positive feature of this resource is to pay with PayPal without fees, which are not charged to the sender. Fees must pay the recipient, depending on the country in which it is. Click here for exchange rates, you need to visit your account and follow the appropriate options, until you get to the command “Calculate”. The security of your service is one of the main activities of the company. All information, which is located in the payment system, including your personal information or credit history, protected. To do this, PayPal uses a special protected area. Warranty Company, not a single person will receive details of your credit card. Another precaution – your salesman will not get a listing, yet you will not come commodity and you do not confirm its acceptance. You can also reclaim payment, if for any reason he changed his mind to cancel the purchase.